A unique twist on the traditional advent calendar, craft beer enthusiasts can countdown to Christmas with a new microbrew for each day of the season. 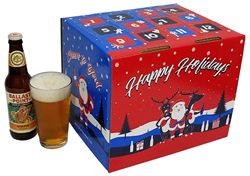 Just in time for the gift giving season, GiveThemBeer is offering an advent calendar that is fully stocked with top-rated craft beer from popular US breweries and can be delivered directly to a home or office. Each microbrew was hand-selected based on its rating, brew style and location. Breweries featured in the assortment are well-known in the craft-beer industry including: Dogfish Head, Rogue, Saugatuck, Ballast Point, Anderson Valley, New Belgium, Stone, Weyerbacher, Elysian, Bear Republic, Bell’s and Funky Buddha. “It's the perfect gift for a craft beer enthusiast to sample a new beer style or brewery that they might not have access to in their region,” states Kym Toner, Co-Founder of the company. From stouts to ales and the ever-popular IPAs, the selection boasts microbrews that are top-rated as determined by beer enthusiasts across the country. “We wanted to include the best of the best when it comes to craft beer. The assortment covers the highest rated beers from coast to coast,” quotes Toner. In recent years, the popularity of advent calendars for adults has been trending in the marketplace. From wine to whisky, adults can enjoy a different beverage of choice for each day of the season. 2017 marks the first time that an advent calendar filled with craft beer from popular US breweries can be personally delivered to beer lovers across the country. The Beer Advent Calendar box was exclusively designed for GiveThemBeer and is currently available for purchase at http://www.GiveThemBeer.com. About Give Them Beer –GiveThemBeer.com was launched in 2014 to offer beer gifts that feature the best craft beer available. “All of our beer gifts create a true craft beer experience. With over 150 microbrews from new and existing breweries across the US, beer lovers are able to receive a gift filled with both classic and unique flavors that can be enjoyed in the comfort of their home,” states Kym Toner, Co-founder of the business. GiveThemBeer.com is the leader of premium craft beer gifts online and has delivered thousands of beer gift baskets, crates, and briefcases to beer enthusiasts across the United States.